After skewering the trailer for M. Night Shyamalan's Devil a few weeks back, we thought it might be fun to compile a list of our favorite movies with twist endings. Enjoy! 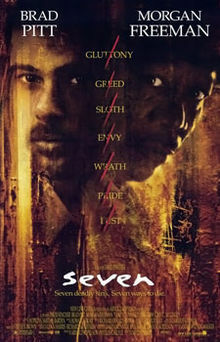 Seven is, in my opinion, one of those Everything Movies with a healthy mix of everything that's awesome: a gripping storyline, a formidable cast (Pitt, Spacey, Freeman and Paltrow, before she turned Goopy? Win! ), the seven deadly sins, and a chilling twist at the end. The way the seven sins were represented and executed sucked me in so much that by the end, when Envy and Wrath unfolded, I was completely blindsided. Never in a million years would I have guessed that the mysterious killer (who we only ever know as Jon Doe) was the symbol of Envy, and that Mills, our rugged, moody detective/hero, would be pushed to Wrath after realizing that his wife's head lolled in a box mere meters from him. And that came after the decaying, starved man/corpse strapped to a bed suddenly lurched to life, the prostitute who was raped and murdered at the same time, and the fat guy who was forced to eat himself to death. See what I mean? Everything. I love a good ghost story. 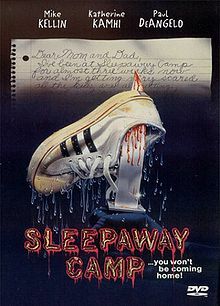 Slasher films and those films billed as psychological horror or supernatural thrillers, while enjoyable, are like Chinese food: I'm full for the moment, but I'll be hungry again in an hour. They are what they are and rely heavily on contrivances and cliches: they smack you in the head and tell you that this is when you should be scared. Horror for them is gratuitously gory. A good ghost story draws you in, drops some hints, throws a red herring or two your way, gives you a false sense of calm (and belief that you know what's going on), scares you, and then gives you the big reveal. Without gallons of blood, a mounting body count, or some misshapen killer. The Others does that in spades. And I have the hair standing on end to prove it (even after four or five viewings). I'm not going to provide you with a synopsis or warn you about spoilers. The movie has been out since 2001 so the statute of limitations on revealing crucial plot twists has long since expired. Let's just say we can boil it all down to its simplest form: ghosts who don't know they're dead. It works despite the fact the audience is given subtle clues throughout the movie - the children talking about when their mother "went mad," lines like "stop breathing," the mother's persistent migraines, the fog, the three servants, the husband's return - the audience is led to believe that the protagonists are indeed alive, not ghosts confined to this particular purgatory. We believe that the house really is haunted; that there are ghosts in the mansion. We just don't realize we've been watching them the entire time. It is not until the last 10 minutes that we, like Nicole Kidman's Grace, realize that these characters are dead and have been for decades and that the "ghosts" are the new owners of the house. There is no final resolution, no moving on. No going into the light, Carol Anne. We are left with a mother and her two children repeating the line "this house is ours" over and over again. They just refuse to leave the place they call home. This house is not clean. Beginning to end or end to beginning? How is this story told? Have I told you about my condition? Can I lie to myself to be happy? 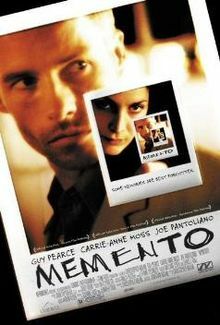 Memento is the movie that had me sitting on the edge wondering if we were flashing forward or flashing back. Could I trust these characters or did they have it all wrong? No one is who they were two scenes ago. Guy Pierce plays Lenny, the central character that makes it all worthwhile, and you sit there captivated waiting for him to figure it all out hoping that he will avenge the dead wife who drives his every move. You see, his wife was raped and murdered and Lenny is hellbent on revenge. It's all he lives for, actually. He tattoos information all over his body and feverishly scribbles notes on Polaroids as a way to remember random facts and people he'll need for the next day/minute/hour, for he suffers from short term memory loss that only affects his ability to form new memories. Anything BEFORE the incident with his wife is safely preserved in his grey matter. You watch him struggle through each day trying to piece together the fragments he's collected, hoping to understand where, why, or how he ends up in each situation. The scenes are so disjointed you feel like you are reeling with the same uncertainty and memory lapses he suffers from and it has an unnerving effect. Everyone knows him, but he has no recollection of anyone. Is he even who he believes himself to be? Are friends foes? Who killed his wife and why? At this point I can't bring myself to spoil the ending especially because of the threatening note that Christopher Nolan pushed under my door, but if you haven't seen this fantastic film PLEASE do so immediately. Oh well. Looks like I'm going to have to break the first and second rules of Fight Club. Fight Club is about an average guy, played by Edward Norton, who has a boring job, a fantastically modern but generic apartment that he shares with no one, and who has to resort to attending random support meetings so that he can feel emotion. He's so average that he isn't even given a name in the movie. 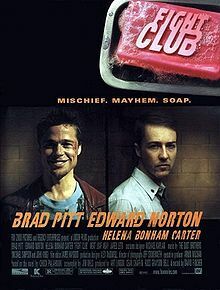 Then one day he meets Tyler Durden, a traveling soap salesman/anarchist who totally changes Norton's character's life. Fight Club is a very gritty film. It makes you question the ideals you hold so dearly. The film is damn near perfect. In fact, the only problem I have with the film is the twist ending. Don't get me wrong, it's a great ending: we discover, along with Edward Norton, that he and Tyler Durden are the same person. Which is cool and all that, until you realize that the original members of Fight Club, the early adopters, were people who joined based on seeing Edward Norton beat himself up. They didn't walk by one evening and find Pitt and Norton wailing on each other in a parking lot; only Norton, punching himself repeatedly. Now I don't know about you, but it wouldn't matter how disenfranchised I was, I still wouldn't follow someone who was beating himself up when I met him. I loved listening to people after seeing The Sixth Sense for the first time try to play it off like they knew what was going on. I would think to myself, 'Yeah right! There is no way you knew what the plot twist was. No. Way.' You see, if I was completely stumped, how the hell could anyone else have gotten it because as a veteran actor, *snort* I watched movies with a keen eye for detail and throughout the entire movie I did not see one hole-- NOTHING to give away the reality of the situation. I remember while watching thinking that Malcolm's wife was so cold, how could she go out and have an affair. Why won't she talk to him? At the very least she should talk to him. The first time seeing it was terrifying. Ghosts are scary and ghosts that are 'displaying' how they died are even more scary. I grew up in two very old houses and would get that prickly sensation on the back of my neck often that Cole speaks of when seeing ghosts, so this movie scared the bejeezus out of me. What I wasn't expecting to happen when I watched it again this past weekend was how weepy it made me, and I am not really a weepy kind of chick. Knowing the plot twist and what to expect gives The Sixth Sense a whole new level of emotion that I missed while watching it through my fingers the first time around. Don't get me wrong-- it still packs the scary punch it did in '99 but it's also an amazing story of love and learning in the most trying of scenarios. It's a really well-written movie with a very true message: people only see what they want to see, as did most people watching if for the first time, proving that M. Night Shyamalan does have talent. Feet walking on pavement, one slightly crooked... as you watch the cerebral palsy slowly disappears until two feet walk straight as an arrow... it's so subtle and unexpected you almost miss it, and that's only one of the indelible images you're left with after watching The Usual Suspects. It is nothing less than an iconic film. The story-within-a-story narrative, the non-linear sequencing, the outstanding performances, and to top it all off, one of the most memorable twist endings EVER! Not bad for a movie that almost didn't get funded and was shot in 35 days! The beauty of The Usual Suspects' twist isn't just that you suddenly discover who Keyser Soze is, it's that the entire story is thrown into question. Out of all those complicated, nuanced events, you can't tell what was real and what was spun from the police station bulletin board. 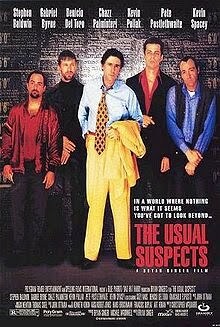 To this day, I cannot see or hear the name Kobayashi without thinking about The Usual Suspects. But you hope, you want to believe in the story because you want to believe in Keaton - or Verbal's version of Keaton - doing the right thing while doing the wrong thing up to the end. You even hope Keaton is still alive, just as you cheer Verbal being released on bail. Then everything is turned on its ear and that is the magic of The Usual Suspects, that you remember and root for these characters and their story even while discovering that the script has betrayed you again and again. Let's face it: at the end all you know for sure is that there's a boat on fire, a Hungarian in the hospital, a couple characters dead, and Kevin Spacey lighting up a cigarette. Frankly, I think every other movie twist ending out there is trying to live up to the emotional commitment of this one. We showed you ours, now show us yours! What's your favorite cinematic twist ending?